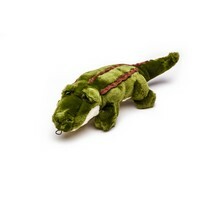 One of Fluff & Tuff's first toys, Georgia Gator appeals to dogs of many sizes and playing styles. Featuring Fluff & Tuffs signature ultra-plush fabric, her longer body is perfect for playing tug-of-war, shaking, squeaking and finally after all of that play, she also makes a great pillow. The Fluff & Tuff Georgia Gator has double-stitched reinforced seams, sewn eyes, durable mesh inner lining for the under amour and a non-toxic fibre stuffing for your dog's enjoyment. This toy is great if your dog likes a bit of rough play, like fetch and tug, and when they are tired from your game, they make great pillows too. Fluff and Tuff are high quality, durable, plush stuffed dog toys.